I do something even more rough: for a fixed location, I plot the variance of the marginal likelihood (Y axis) against the number of particles and I check where the curve levels off. To me the above slice of the marginal likelihood suggests that using a ML or MAP estimator in this context might be preferable to a full MCMC analysis. Even more so if the computational budget is limited… any thoughts? The problem is that the number of particles/samples is assumed constant across the parameter theta. If the variance of the log-likelihood estimate is easy to compute, then the optimal number of particles can be selected as a function of the parameter theta so that the variance of the log-likelihood estimate equals 1. See http://arxiv.org/abs/1309.3339 for a detailed discussion. We do agree with you that the variance of the log-likelihood estimator is not constant across the parameter space. However, in practice the issue is whether the variance is approximately constant under the posterior for theta. As T, the number of observations, increases then the posterior will typically concentrate around a central value at the rate 1/sqrt(T). Therefore, under reasonable assumptions, the variance (which is a function of theta) will itself become more concentrated around a central value of choice. Results formalizing this intuition are given in the previous version of arXiv:1210.1871; see Lemma 4 in Section 6 and the associated figures. (This section has been suppressed in the third version for space reasons). Your graph is not reflecting this point as you are only displaying the log-likelihood estimate over a grid of values of theta, rather than over posterior samples from theta. You are considering a log-likelihood range of about 300 whereas to reflect posterior support one would normally consider a range of 3 to 4 (under a reasonable prior). By just looking at your graph, it is clear that this would reduce substantially the range of relevant theta and consequently the variability of the associated variance across this interval. http://www.stats.ox.ac.uk/~doucet/ExaminingAssumption.pdf histograms of the log-likelihood estimator error evaluated at the posterior mean. We also display histograms of the log-likelihood estimator error over the posterior for the parameter. We do this for various values of T (number of data samples) and number of particles N. For T small, the posterior over the parameters is fairly diffuse and neither our constant assumption for the variance nor the normality distributional assumption for the error hold. As T increases, the distribution of the log-likelihood estimate evaluated at the posterior mean and the distribution of the log-likelihood estimator error under the posterior are essentially indistinguishable and correspond very closely to the postulated normal distribution as expected. We present these results for a simple AR(1) Gaussian process observed in Gaussian noise but also for a complex continuous-time two-factor stochastic volatility model applied to real data. Hence we believe that in for moderate to large data one can rely on theory and that the guidelines we provide are useful. Thanks for your considered (and polite!) response. Your intuition about the large T limit may well be correct, but I’m often interested in small T. There I’m not totally convinced by results based on 100 samples from the posterior. I’m sure we can all agree that there is less of a problem if the posterior has compact support. My concern is that the variance of the estimator increases (and is unbounded?) as the MCMC chain takes an excursion into the tails of the posterior. For the problem in my post, the corresponding posterior is shown in Figure 10.5 of my book, and the summary stats for it are shown on page 298. Near the posterior mode, at around 0.95, the variance of the log-likelihood estimator is roughly 1. 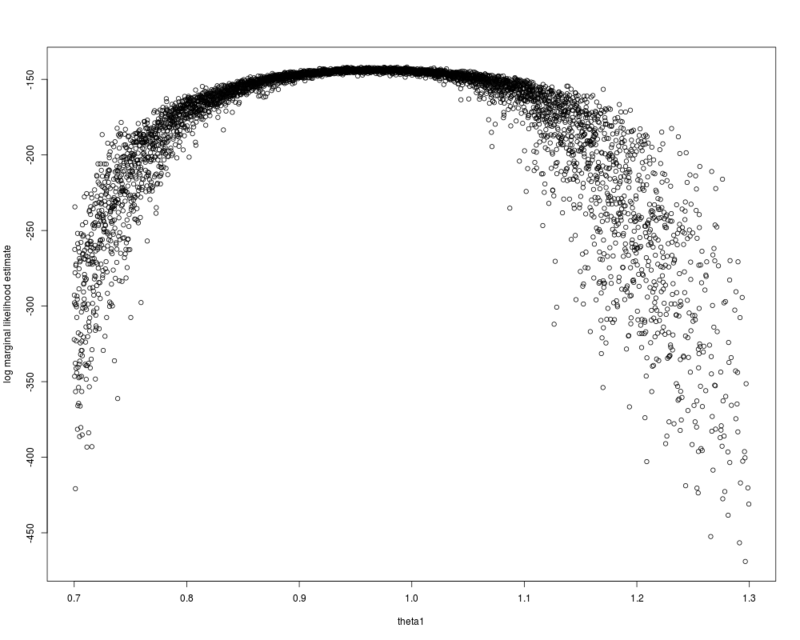 However, at 0.84 (around the smallest value my MCMC sampler visited), the variance is around 17. This may be a slightly less dramatic difference than a naive look at my plot would suggest, but it’s non-trivial. It certainly makes a difference whether you tune the number of particles at 0.84 or 0.95. You are right in that it does clearly make a large difference (16 fold) whether you choose N based upon the posterior mean or the tail value. However, if you choose based upon the posterior mean then it is clear (from your graph) that a random walk, RW, proposal will almost always accept moves from the tails towards the posterior. This can be seen because pi(theta’)_/pi(theta), with theta’ being the proposed value near 0.95 and theta being out in the tails (say, 0.84) will be very large relative to exp(z’-z), where z is the log-likelihood error. So the performance (stickiness) of the scheme will be governed by what is happening near the mean of theta. If you were to implement a RW particle scheme for your model and to plot the IACT against sigma (the SD evaluated at the posterior mean, 0.95) by varying N then I would imagine this would be minimised around the values suggested in the papers. I have not yet really done anything with particle filters, but clearly, I am interested in having a try. Right now, my (modest) objective is to get a qualitative idea of how the approach scales with the size of the problem (T). So it is not exactly the subject of your post, but still it is a related issue. Is it correct to say that, under relatively general conditions, the complexity of a particle MH will typically scale as O(T^2) ? That is, the variance of the estimator of the ratio of likelihoods, or equivalently of the variance of the estimator of the log likelihood, will be in T/N, where N is the number of particles, and this is more or less what you want to control in order to keep the acceptance rate afloat. Thus, the number of particles should increase linearly with T, so that the resulting mcmc is in O(NT) = O(T^2). This seems to be suggested by some of the articles you mention, but I am not yet sufficiently comfortable with the whole thing to be sure that I understand correctly. Yes, the folklore (supported by theory) is that the number of particles in your filter should scale linearly with the number of time-points, at least when being used inside pMCMC algorithms.